I adore my yoga students for so many reasons. They pretend to laugh at my lame jokes, support me during my dog’s many health issues, and encourage me in my other major endeavor, writing yoga and dog-based mysteries! 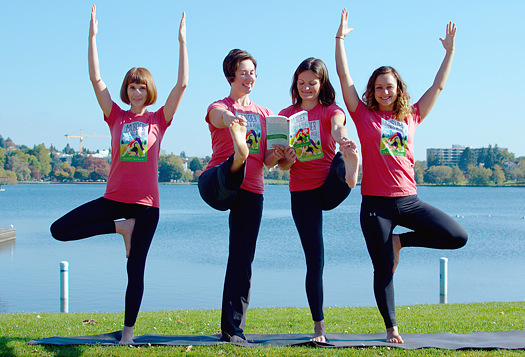 Recently, several of my students went well beyond the call of duty by posing (pun intended) as yoga supermodels to help promote my first book, MURDER STRIKES A POSE. Today, I share a 7 of almost 200 final photos with you and say a GREAT BIG HUGE THANK YOU to the models and their photographer. More photos coming soon on Facebook, Twitter, my two blogs (this one and Killer Hobbies), and my author mailing list. Brush up on your yoga, dog, and Seattle trivia and keep your eyes peeled. You might win a free copy of the book or a Downward Dog Mysteries coffee mug! Katie Burns, Shana Robbins, and Katelyn West. Anyone recognize the prehistoric beast behind them? The perfect portraits of Rene de los Santos, Larra Dutton, and Katelyn West meditating in Sukhasana. Sarah Mercier, Shana Robbins, and Jenny Zenner. Three female warriors reading MURDER STRIKES A POSE. Who’s that clown hanging out with Shana Robbins and Katie Burns? And why doesn’t Katie open the book so he can read it? Peace-centered Tadasana with Larra Dutton, Rene de los Santos, and Katelyn West. Yoga, like the rest of life, is a balancing act. With Kim Tull-Esterbrook, Shana Robbins, Jenny Zenner, and Kiyoumi Weibye. And finally Shana Robbins, Jenny Zenner and Sarah Mercier—Handstand on the Seattle waterfront. And the world’s worst picture of me, just to prove I was there. And my husband and photographer extraordinaire, Marc Martin. Couldn’t do it without you, honey. This entry was posted in Asana, Gratitude, writing on October 28, 2013 by Tracy Weber. What Color is Your Monster? Whole Life Yoga’s advanced yoga teacher training started this past weekend with a three-day retreat, the primary goal of which was build a single, cohesive community out of thirty students from ten prior trainings—some that took place almost a decade ago. I planned several small group activities, but I consciously decided to leave out the introductory large group circle, in which every person shares information about themselves, their goals, and their challenges to the rest of the group. Three weeks ago, I had a sudden feeling that omitting the circle was a bad idea. I sent an e-mail out to the students to get their opinion, and they agreed: the activity had to be on the agenda. One person teased that if we did the circle activity, I might give her another crystal. Now I had a problem. My circles come with presents, and these students knew it. In the 200-hour training, each person who introduces themselves receives a clear quartz crystal to place on the mat in front of her. The crystal tells us who has already spoken. Even more, it symbolizes my hope for each class member: the clarity of mind promised by persevering yoga practice. What did I want for this group, and how would I symbolize it? I already knew these wonderful people from their 200-hour trainings. Some have studying with me for well over a decade; others less than a year. We were about to start another sixteen month journey, much of which wouldn’t be easy. Many of them were already struggling through very tough times. Clarity. Of course I wished them clarity. But I wished them more than that. Strength to overcome internal and external struggles. Strength to face the inevitable challenges that life would throw their way. Strength to overcome their own internal gremlins. I told my husband to grab his car keys. Destination: Archie McPhees. I searched through shelves filled with squishy balls, wind up dentures, rubber chickens, and bacon flavored dental floss. I finally found what I needed in a display rack next to rubber horse heads and assorted Halloween costumes. Monster finger puppets. The perfect symbol for the silly, yet powerful, inner demons we all have. The doubts we allow to hold us back. Sometimes our demons are critical voices inside our head. Sometimes they take the form of exhaustion. Sometimes they feel a whole lot like fear. But in all cases, we give them their power. Yoga promises that if we take the time, do the work, and have the courage to look at them clearly, they will have no more power over us than these silly rubber toys. My challenge to all of you, teachers-in-training or not, is to look for the inner demon that holds you back. Confront it. Laugh at it. Refuse to let it stop you. Be all that you want to be and more. This entry was posted in Teacher Training, Yoga Philosophy and tagged yoga, yoga sutras, yoga teacher training on October 21, 2013 by Tracy Weber. It took language to undo the language lashed at me, to make me raw, exposed, weep, alive, aware. Tracy’s words were not tender. No. Tracy Weber is perfectly matter-of-fact. Hearing her voice of honesty broke open my heart and awareness to recognize the earlier words said to me that I believed true. That I was not wanted. That I was an ungrateful, selfish slob. A burden. Three and a half months into Tracy’s yoga teacher training program, I awoke in a new year with the obvious realization of my truth, my completely un-unique experience that I’d accepted as true and denied as existing. Hearing girlfriends share their own experience, several years of yoga on the mat, several more years of meditation on the cushion, and finally, through Tracy’s open disclosure of words said to her, it added up. By writing the sutra paper assignments, I finally revealed the experiences I had let grip me. Words hysterically sobbed at me stuck. Finally, unstuck, I put pen to paper, finger to keyboard, and began to release the load, letting new language lead me. It took sitting to find some stillness. It took vinyasa to begin the loosening. It took breath to recognize the shallowness. I was taken. At my tipping point primed by the practice, I arrived to Tracy ripe. Through the language of the sutras, the language of Tracy’s experience, the language of the instruction, I found my own story. I don’t have to repeat what all words were uttered or by whom. The only finger pointing required is to give credit to those who spoke and wrote the words that healed. My practice began as an undergrad. As a philosophy minor, I studied eastern religion and finagled an independent study of Living Buddha, Living Christ byThich Naht Hanh (aka “Thay”). Thay’s words paved the way from my Catholic upbringing to Buddhism. Off to grad school, I sought a meditation group led by Pam Perrugi Marraccini in Thay’s lineage. I read and heard speak Tara Brach, Robert Thurman, His Holiness the Dalai Lama, and whoever happened to be on Oprah. A dear friend, Allison Parry Leach introduced me to Hilary Steinitz Jackson’s juicy vinyasa flow yoga classes, our girls night out breakup cure. All this prepped me to arrive at Whole Life Yoga to begin becoming whole. It continued. It took finding love. Getting dropped on my head. Losing my asana practice. Fawn’s physical therapy. Burnstein’s traditional therapy. Bibliotherapy. Acupuncture. Massage. Putting words to what is, I continue to write. Some stories take manual extraction. Moving through sun salutations, twisting, compressing, and holding poses, yoga unleashes. A jog jars stagnation. Ginger lovingly maneuvers me to necessary insights on her massage table. Touch. Recognition. Connection. The union of rejection and acceptance. Beyond forgiveness to compassion. The words at me. The words with me. The words forward. This entry was posted in Guest Writers, Teacher Training Graduate Stories, writing, Yoga Philosophy on October 14, 2013 by Tracy Weber. I wrote this post several months ago, but as with many posts of a personal nature, I waited to share it. Tasha’s MRI ruled out most scary diseases and identified some that were treatable. The photo in this article was taken 90 minutes after she had surgery to replace her hip, which was hopefully her biggest problem. But the primary learning for me is that, as the sutras say so beautifully, I can hold on to my past and let it dictate my future, or I can let it go and live in this amazing present moment. It’ s my choice. It’s yours as well. I was nineteen the first time a serious-looking doctor told me I might have a brain tumor. The tiny, rare growth she thought had taken up residence inside my skull terrified me. Tests showed that I probably didn’t have it—yet. But I’d need to be reevaluated if any more symptoms appeared. In my mid-twenties, a second doctor with an equally serious expression said I needed more definitive tests. If I refused, I potentially faced a number of bad outcomes, including blindness. For the next several years I rotated through blood tests, contrast CT scans and multiple MRIs. Every time I went to a doctor, the diagnostic circus (and the associated panic) would start again. In my early thirties, I stopped going to doctors. By the time I started having checkups again in my forties, my physicians were too focused on menopause to worry about my little non-existent growth. About two months ago, my beloved dog started ailing, and we don’t yet know why. As a physician friend of mine says, “Ask two doctors and you’ll get three diagnoses.” Tasha has been to six. An MRI can definitively diagnose several issues, but it’s expensive, so most vets don’t recommend it. A few weeks ago, I finally brought it up myself. “Would an MRI be a good idea?” I asked. The unanimous answer was yes. As the time for the neurologist appointment approached, I started feeling anxious. Tasha’s health has been improving the last several weeks. We’re finally developing plans for her future. I was the one who suggested an MRI. Why, then did I suddenly start panicking? I spent some time Saturday reflecting on The Yoga Sutras. The sutras say that dvesa—holding onto prior pain—is one of the primary causes of suffering. In one swooping rush of insight, I realized that my panic was more about my past than Tasha’s future. I had equated Tasha’s upcoming neurologist visit to all of my terrifying evaluations in the past. Somehow, that simple realization calmed me down. My anxiety, while not completely eradicated, was significantly reduced. Tasha and I met the smiling, friendly neurologist this morning. He evaluated Tasha and said that he did, indeed, think an MRI was warranted. But none of the issues he suspects are deadly, most of them can be fixed, and none of them are brain tumors. He suggested we do the test today, so I didn’t have to wait any more. He’s even allowing me to be with my dog as she comes out of anesthesia. Tasha’s in the MRI now, and I don’t know what the images will show. But I do know that Tasha’s issues have nothing to do with my past. I can release that irrational fear now, thanks to yoga and the insights it continues to give me. 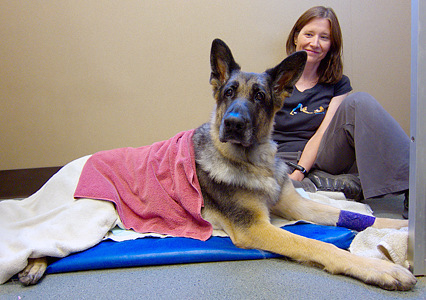 This entry was posted in dogs, Yoga Philosophy on October 7, 2013 by Tracy Weber.